So…that was an intriguing few weeks leading into the Election! But I for one was pretty happy to see those party billboards come down - political overload. 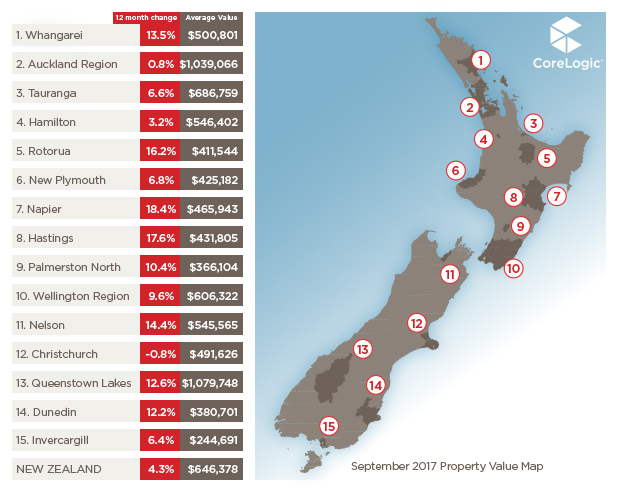 Whilst we may not know the make-up of our Government just yet, September has now passed so it’s a good chance to draw a line in the sand for how NZ’s property market is performing, before a new Government takes over. The average value of a dwelling in New Zealand is now $646,378. This is an increase of 4.3% over the last year and 1.1% in the last three months. Looking further back, it’s 56% higher than it was at the end of 2007 (when the market last peaked). 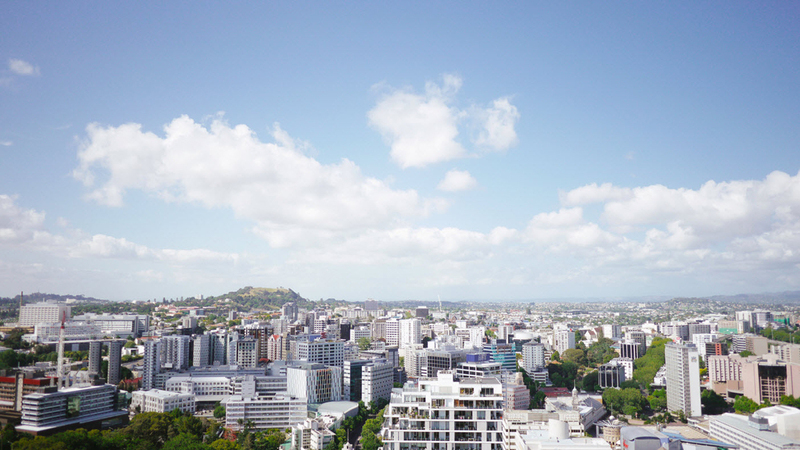 In Auckland the average value is $1,039,066 and of course - Auckland’s sheer size means its influence over the national value figure is significant. Back in 2007 the average Auckland residential property value was $546,488, compared to the nationwide $414,355: a difference of just 32%. Today? That differential has jumped to a whopping 66%. 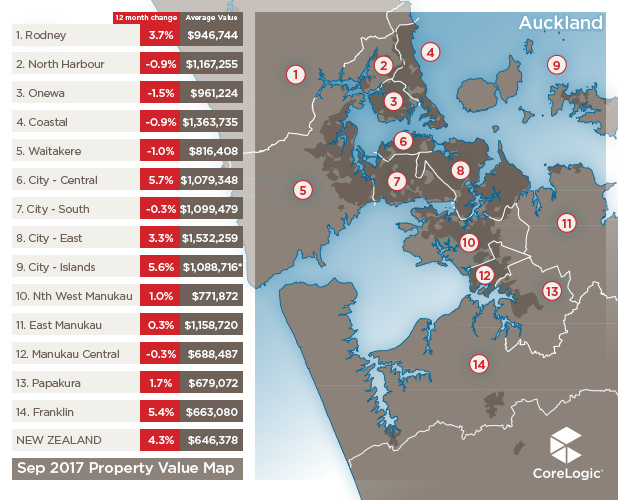 This illustrates just how different the NZ market is today compared to a decade ago and also signals how there’s almost zero point comparing Auckland with the rest of the country. It’s out on its own when it comes to size, price and economy. 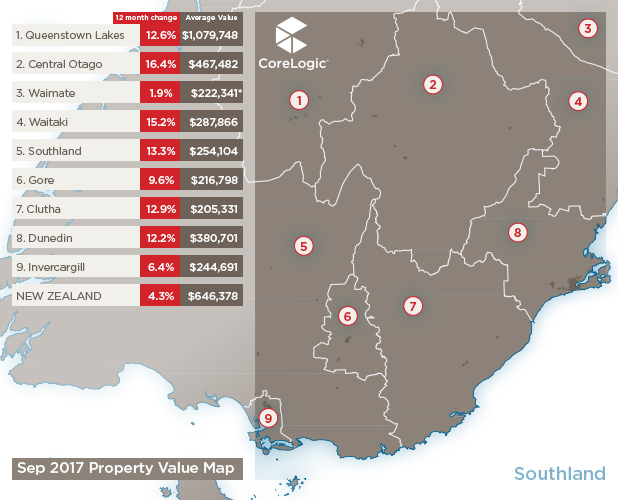 Queenstown may have a similar average value but the factors driving this are varied compared to Auckland and it’s just 3% of Auckland’s size. Auckland has its own internal variations happening. 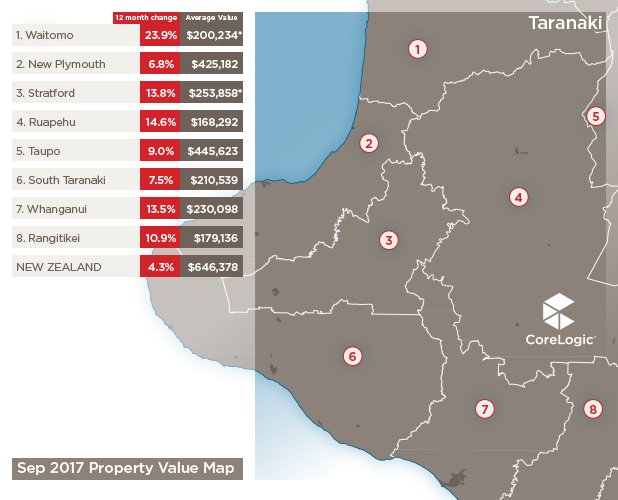 The greatest decline in value over the last few months has occurred in the outer areas, but this downward trend has mostly ended, with both Papakura and Franklin actually seeing slight value lifts from August to September. 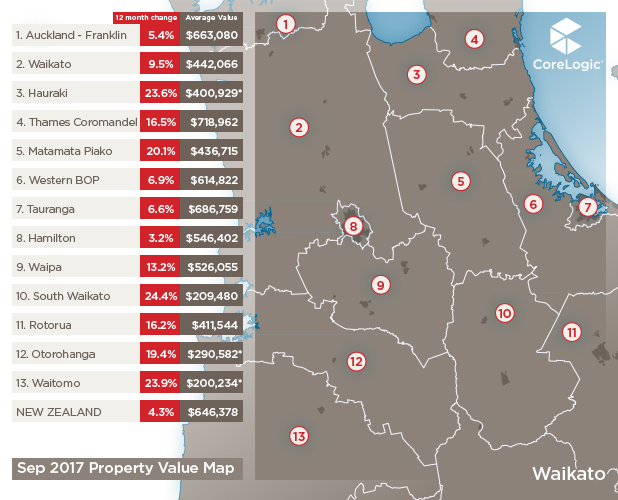 It’s the more expensive parts of Auckland - Auckland Central and the North Shore - that are experiencing a consistent downward trend now. But Rodney gets the dubious title of worst performing Auckland area, with a 1.7% drop in the last three months. It’s very likely that in these areas unaffordability is starting to bite, with the combination of stricter LVR limits, higher interest rates and tightening credit criteria reducing the amount of money people can borrow - those higher Auckland prices require larger sums of borrowed funds. Add in a bit of uncertainty and the result is a very low turnover. 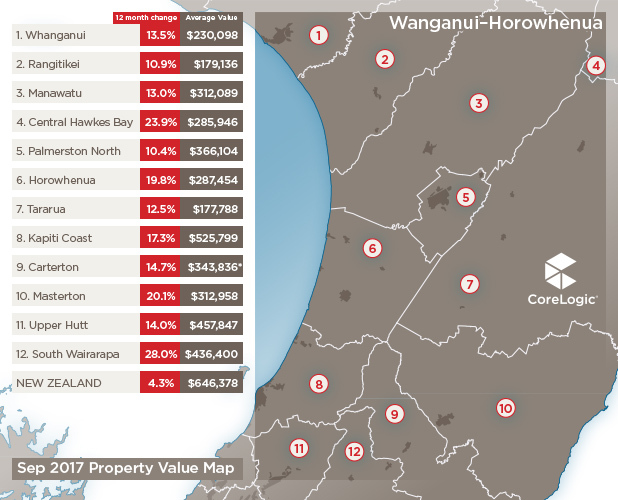 According to the latest QV index we’ve seen a sharp one month drop in Tauranga values. 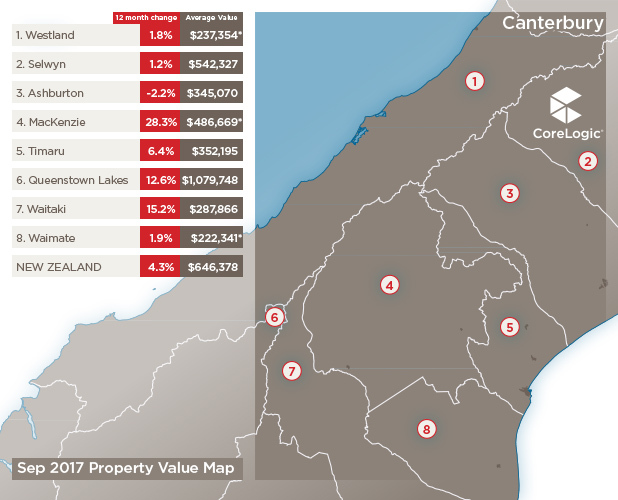 With the slowdown occurring throughout most of the main centres in 2017, Tauranga had bucked the trend, but it appears this strength couldn’t be maintained. 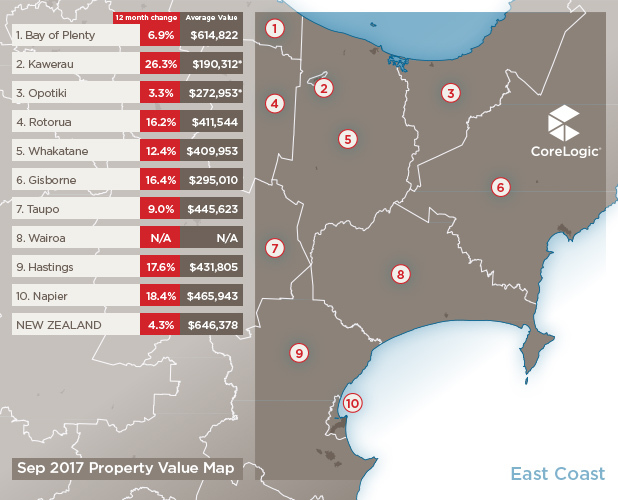 Looking into more detail it was the top end of the market (properties above $750k but especially those over $1m) that was maintaining the strong growth. Values at the top end of the market have grown 16.9% in the last year at a time when market-wide values have only increased 6.6%. Movers and investors from Auckland will have been a contributing factor to this growth but unaffordability at the top end of Tauranga, as with Auckland, will now be having an increased impact on demand. 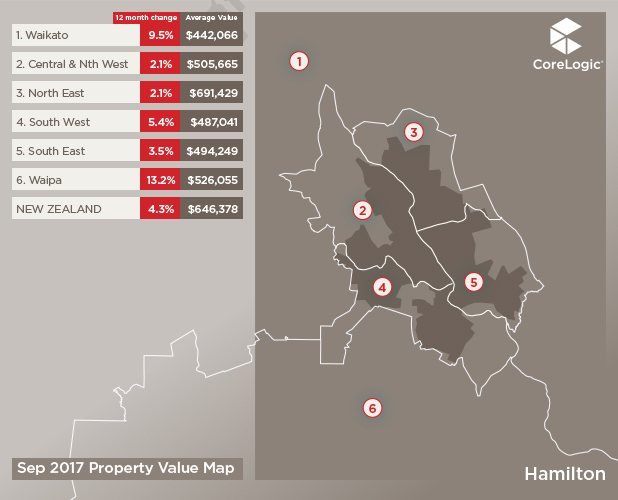 In Hamilton annual value growth has dropped to only 3%, although more recently the market has started to pick up with 1.3% growth throughout Q3 this year. Hamilton’s average value is now $546,402 - 51% higher than the end of 2007. In Wellington we’ve now seen effectively no growth for 6 months but due to growth throughout last spring and summer, values are still 10% up on the same time last year. 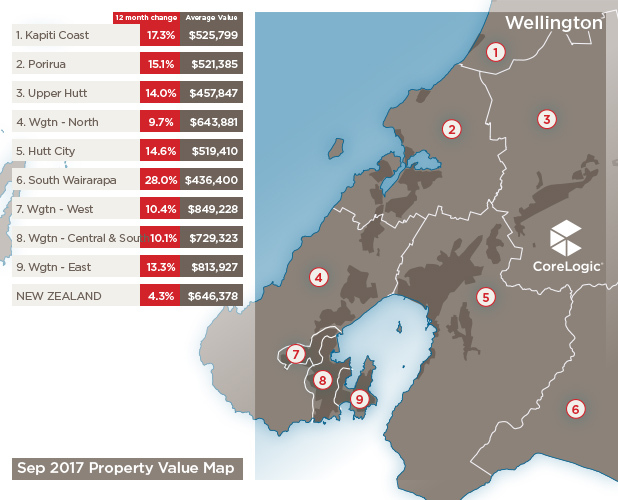 It remains to be seen whether the same growth will occur through the same seasons this year but spring hasn’t started well, with significantly reduced demand and sales volumes, especially in Wellington City (compared to the Hutt and Porirua). 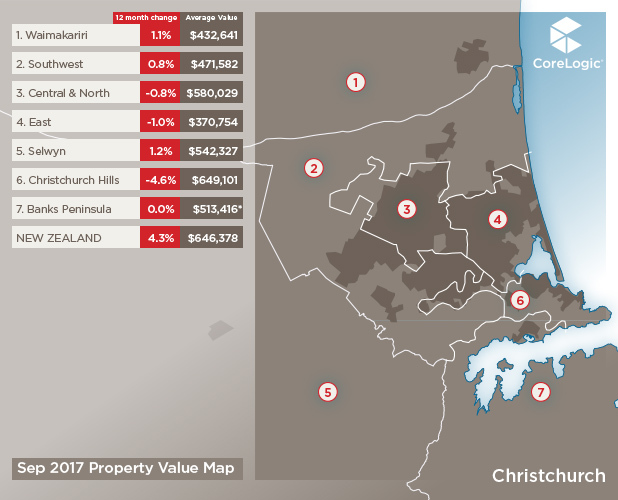 Values in Christchurch have continued to slide further away from $500k, with the average value now sitting at $491,626 after ‘peaking’ last November at $501,229. Christchurch is at a vastly different part of the property market cycle, due to being disrupted by the major earthquakes in 2010/11, and appears to now be in a consolidation phase as supply adequately satisfies demand as population growth slows and residential construction winds down. 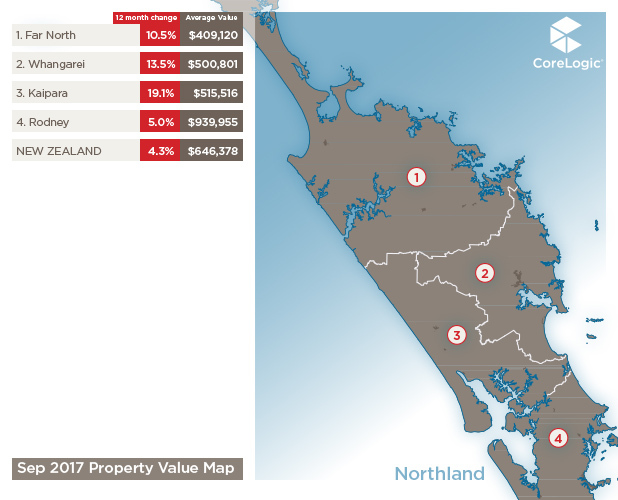 In Dunedin there are signs of an improvement in average values with 1.4% quarterly growth after values plateaued from April to the end of July. 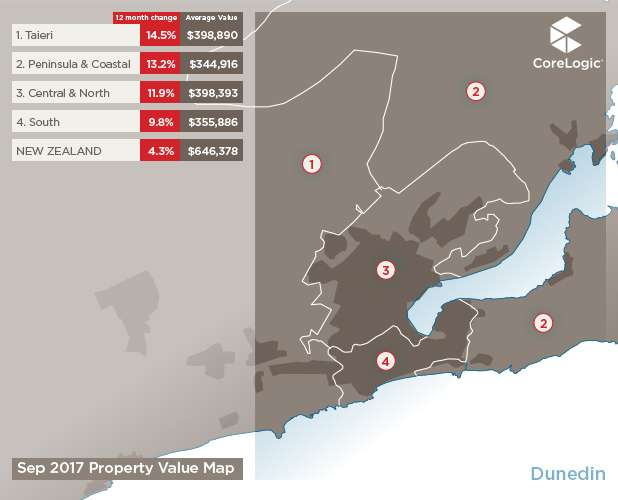 Dunedin’s average value remains low compared to the other main centres at $380,701 and this is 33% higher than the average value back at the end of 2007. Outside our main six centres, the pick of the bunch is Napier. 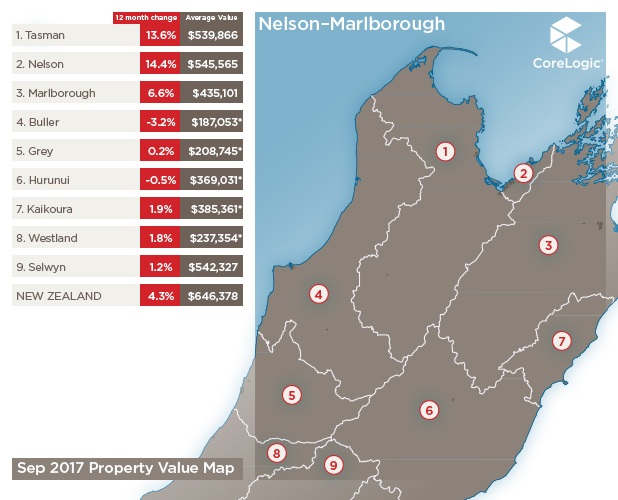 Things are still very bright over on the East Coast of the North Island with values continuing to grow at 5.2% quarterly, which is currently the strongest of all cities in NZ. Over on the western side of the Island, New Plymouth is going through a sustained flat patch with only 0.5% growth in the last three months and only 6.8% in the last year. So where are things headed? My pick is that values will start to increase again in 2018. Probably early 2018 if we get a National led Government, due to fewer policies addressing the strong demand for property. But even with Jacinda Ardern as our next Prime Minister, it’s likely that prices will lift in 2018 (albeit later than if Bill English is in charge), due to strong underlying fundamentals (low interest rates, constrained construction) making up for any tightening in migration policy or other tweaks designed to reduce investor demand.